Wheeling Heritage serves as project manager for the Mt. Wood Cemetery Restoration Project and works with partners to ensure a bright future for this forgotten cemetery. Mt. 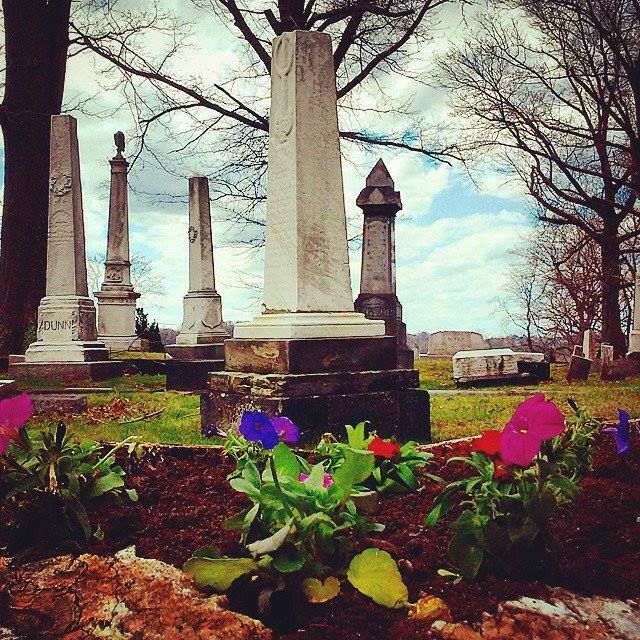 Wood Cemetery is Wheeling’s oldest extant cemetery located within city limits. Established in 1848, the cemetery was designed during the rural romantic movement which paid homage to its location’s significant and unique topography. Located above what was known as Jonathan’s Ravine, just off of National Road, and overlooking both the Wheeling Creek Valley and the Ohio River Valley, the cemetery was a popular place of internment during the mid- to late 1800s. Preservation began in the summer of 2012 when a grassroots movement of several local organizations and volunteers began meeting on Mt. Wood’s behalf. Long the victim of vandalism and the effects of gravity, many of the gravestones and monuments were falling over, leaning, or in desperate need of a cleaning. Wheeling Heritage began the preservation efforts when they wrote the nomination for the National Register of Historic Places in September 2013. With that nomination, Mt. Wood became Wheeling’s first cemetery to be named to the National Register of Historic Places. Work at the cemetery was launched with a Friends of Wheeling cemetery tour in May 2013 that brought over 300 people to the location. In addition, a 3-day gravestone conservation workshop with a gravestone conservator in June 2013 helped to spur volunteer efforts, beginning workdays at the cemetery that drew an average of a dozen volunteers each day. Starting with only one workday a month in the fall of 2013, there have been over 100 volunteers who have taken part in dozens of workdays at the cemetery equaling almost 500 volunteer hours! Restoring a cemetery is a stone-by-stone endeavor and is not a fast process. Since 2012, Friends of Wheeling, the Public Policy Foundation of West Virginia, Wheeling Young Preservationists, Wheeling Area Genealogical Society, and the Irene Meagel Fund at the Community Foundation for the Ohio Valley have all been involved in various projects at Mt. Wood. Many local businesses have donated both time and materials to the efforts, enabling progress to continue at a steady rate. While the cemetery has come a long way over the past 5 years, there is still quite a bit of work to be done. Attention is being turned to the retaining walls that are located along the road in the cemetery and the 10 mausoleums that are in various states of deterioration. In 2015, the cemetery received a grant to develop historic structure reports on two of the cemeteries endangered mausoleums.